අපි දැන් බලමු කොහොමද Sensor Unit එකට NRF24L01 Transceiver එක සම්බන්ද කරගන්නෙ කියල. මෙතැනදී අපිට කලින් Unit එකේදී වගේ Sensors 8ක් සම්බන්ද කරගන්න හැකියාවක් ලැබෙන්නේ නැහැ , අපිට පුළුවන් වෙන්නේ Sensors 7ක් පමණක් සම්බන්ද කරගන්න විතරයි. ඒ මොකද මේ NRF24L01 Transceiver එකට pins 5ක්ම Arduino Board එකෙන් වෙන් කරන්න සිද්ද වෙන නිසා.අපි දැන් බලමු connection දෙන්නේ කොහොමද කියල. පලවෙනි PIR sensor එකේ Data pin එක Arduino Board එකේ D2 පින් එකට connect කරගන්න. දෙවෙනි PIR sensor එකේ Data pin එක Arduino Board එකේ D3 පින් එකට connect කරගන්න. තුන්වෙනි PIR sensor එකේ Data pin එක Arduino Board එකේ D4 පින් එකට connect කරගන්න. හතරවෙනි PIR sensor එකේ Data pin එක Arduino Board එකේ D5 පින් එකට connect කරගන්න. 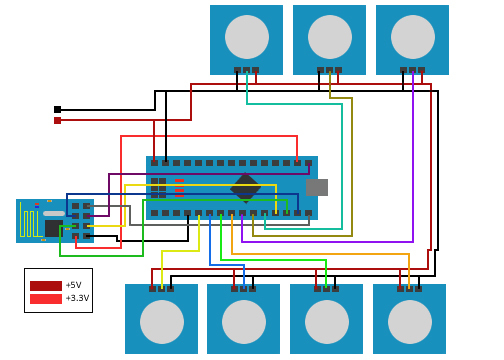 පස්වෙනි PIR sensor එකේ Data pin එක Arduino Board එකේ D6 පින් එකට connect කරගන්න. හයවෙනි PIR sensor එකේ Data pin එක Arduino Board එකේ D7 පින් එකට connect කරගන්න. හත්වෙනි PIR sensor එකේ Data pin එක Arduino Board එකේ D8 පින් එකට connect කරගන්න. හරි දැන් පරිපථය හදාගෙන ඉවරයි.ඊට පස්සේ Introduction page එකට ගිහින් latest software එක download කරගෙන install කරගන්න.එක install කරන්න කලින් C:\HBSN කියන folder එකේ තියෙන පහත සදහන් files ඔක්කොම backup කරගන්න. මෙතැනදී Control_Unit.ino කියන sketch එක main control unit එකට upload කරගන්න.ඒ වගේම Sensor_Unit.ino කියන sketch එක sensor unit එකට upload කරගන්න.